Can the economy revive if banks don't start to lend again? 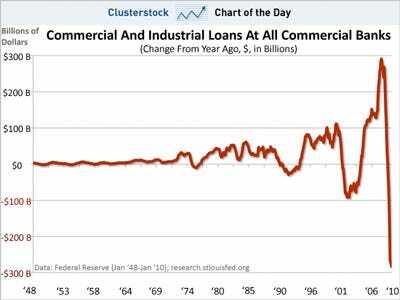 Today the St. Louis Fed released its latest monthly look at commercial and industrial loans at major banks -- a measure that some would say represents the essence of the US banking system. 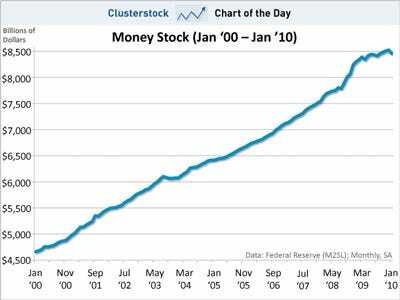 Yesterday we pointed you to the latest data from the St. Louis Fed showing that bank lending continues to plunge. 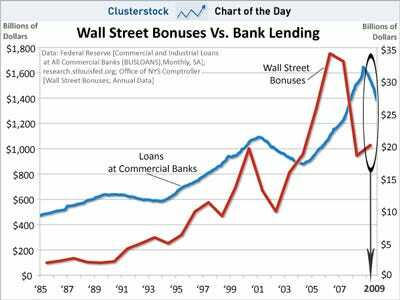 Rather than ply businesses with loans, banks are instead opting to hoard cash and buy Treasuries. And yet despite the lending shutdown, bonuses are back up, per fresh data out today from the New York Comptroller. In other words, sitting on your hands and doing nothing is a pretty lucrative gig. 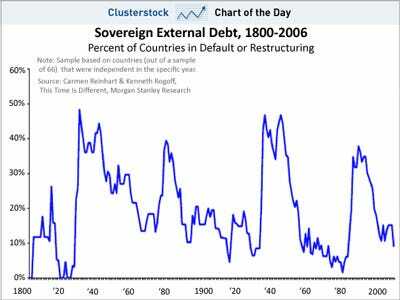 This chart from Gerard Minack at Morgan Stanley, inspired by the research of Harvard professor Ken Rogoff, shows how, surprisingly, sovereign debt crises are pretty common from a historical perspective. The developed world has gone through many cycles of debt accumulation followed by sharp and sudden corrections of debt imbalances via sovereign debt crises of some form as shown below. The blue line indicates the percentage of nations either in default or restructuring their debt each year. You can see that individual national crises tend to clump together and happen in waves. The last wave was around 1990, while the 2000's were characterised by a lull in overt sovereign debt problems. Here's an unemployment chart you'll both love and hate, from Citi's Steven Wieting. 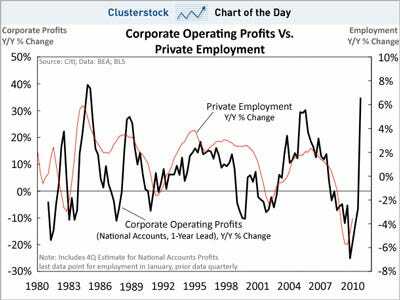 As shown below, since 1980, employment (in red) has fallen after corporate profits (in black) have risen, and vice versa. The relationship is very clear. Problem is, there's about a one-year lag between the two trends. This highlights what should simply make sense -- companies hire people once they see profits rebounding, and more importantly once they believe that adding more people will lead to higher profits. Still, this fact of economics isn't fun for the unemployed. It's constantly argued that the one reason the stock market recovered so swiftly from last year's decline was the rapid expansion of the money supply, courtesy of The Fed. That may be, but soon that reason will no longer be valid. The latest measure of M2, which is one of the ways the Fed measures the total supply of money out there, shows convincingly that the great expansion has peaked. Actually it's not just peaked, it's cresting in a way that's unprecedented on the chart.